This is adapted from Mallika badrinath's recipe. I have made few changes to it. Main change was to remove the ghee from the list of ingredients :) The original recipes also uses small onions (pearl onions) and i didn't have them and i used regular onions and it still tasted good. This is nice variation to the regular cauliflower curry that we make and i made it mainly to send something different for JFI Cauliflower. This is very spicy, so pls. adjust the pepper and redchillies according to your taste. Steam cut cauliflower in microwave for 5, 6 minutes. In the meanwhile, cut 1/2 onion and saute in little oil along with pepper and red chillies. Let it cool. Add 1 spoon cumin seeds to the onion, pepper and redchillies and grind them with little water. Do not fry the cumin seeds along with the above said ingredients. It will smell like medicine when you cook! Heat little oil and pop mustard seeds. Add hing, curry leaves and urad daal and saute till the daal is golden brown. Add the remaining chopped onion and saute till they are translucent. Add the steamed cauliflower, ground paste and salt to taste and cook till the raw smell goes. It is sort of a dry curry (not too dry), so it tastes better with Rice than with Rotis. 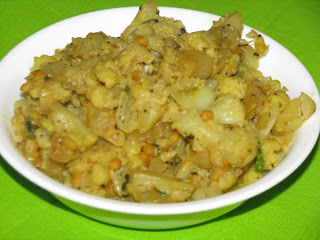 Cauliflower pepper curry looks delicious Vibaas...loved your puri masala too. this is a new combination...a good variation to the usual cauli curry... looks yummy! nice variation to the usual one .will give a try. pls collect ur award too dear!! your curry looks super yumm..thanks for stopping by!! Curry looks delicious Vibaas..I have something for u in my blog. Pls accept! Excellent curry, love the addition of pepper, must be tasted delicious na!! Wow the curry looks so yummy delicious. nice to see a variation of cauliflower recipes. cauliflower pepper curry looks yummy dear. Yummy looking curry. I like the combi of cailiflower and pepper. I had tried a similar dish from the net long back and now thanx to you for sharing yours. looks and sounds yummy. Nice idea to add pepper to cauliflower. Btw, you can also send this to Divya's Think Spice-Think Pepper event. Nice combination of pepper and cauliflower..Simple and delish..
thx for your lovely comments, friends. Asha, i think it's think spice think pepper. thx for letting me know. will update the post later. Thats an interesting twist to cauliflower vibaas..and am a flower admirer. what a coincidence! I just posted cauli..kurma recipe.. and I see another version of cauliflower recipe..looks delicious! looks super yummy! nice recipe for cauliflower, i don't do it very often; your recipe is pushing me to do it. bookmarking this one! That looks delicious! I love cauliflower in any form. woo my fav curry...good with puri.. This is a good recipe...does Mrs Mallika have a website? hiii, finally get to see all the posts i missed. loved the poori baaji post. it has been and still is a hot favourite with us. Cauliflower - pepper combo is new to me. sounds good and yummy. pepper in there is a nice twist! Vidhya, thanks for those lovely words at my blog. Vadagam is nothing but a mixture of all the Tamil nadu tempering spices...preserved in such a way...it lasts for years!!! Has distinct aroma...tells the whole neighbourhood!!! Love mallika badrinath's recipes. Thanks for sending it to Think Pepper event!